Silicone O-Rings – Arizona Sealing Devices, Inc. These O-rings are resistant to UV damage, corrosion, oils, chemicals and solvents. They are used for electrical insulation and are dielectrically stable. Silicone O-rings aren’t toxic, and therefore are FDA approved to be used in food handling equipment and appliances. Silicone is an inert material, meaning it doesn’t react with most chemicals. The medical industry therefore uses it for applications like complex medical implant systems that have moving parts requiring a sealant such as an o-ring. The aerospace, automotive, food processing and jewelry industries use silicone O-rings in their machinery and tubing or piping systems as well. Silicone o-rings sometimes require the use of a lubricant, if the two pieces it is wedged between are moving pieces. The lubricant protects the silicone from quick deterioration. This is a common thing among all o-rings, whether they are metal or rubber, flat or round. Silicone o-rings are naturally an opaque and partially transparent color, which is why they are sometimes called clear o-rings. However, clear o-rings are also produced from other materials such as Teflon, and silicone o-rings can be altered to match any color available. Silicone is an element derived from quartz. For use as an o-ring, three other chemicals are added; methyl, phenyl and vinyl. The combination of these four elements make the silicone used for silicone o-rings a synthetic material. Its temperature resistance ranges from -60°C to 225°C, and some special varieties are able to range from -100° to 300°C. They come in many different sizes, and are formed by joining a piece of silicone cord at its ends. Silicone itself is developed in two major fashions. Liquid silicone rubber, also known as LSR, must be heated and cured to reach its moldable state, while high consistency rubber (HCR) must be melted and then cooled before it can be set in a solid state. LSR is the silicone best suited to o-ring designs. Silicone O-rings are odorless, non-toxic and will never grow mold. Although they are flexible in low temperatures, they have low tensile strength, poor tear strength and low wear resistance. A Teflon sleeve is one possibility for additional protection from erosion since Teflon is stronger it works well as a cover for less durable o-ring materials. O-rings made of silicone are therefore better suited to perform in higher temperature applications. 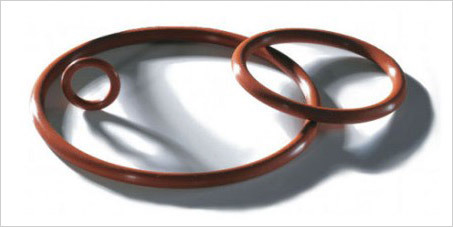 Silicone O-Rings Silicone O-rings are round, highly temperature resistant devices that seal connecting pieces in machinery where flexibility and longevity are important.